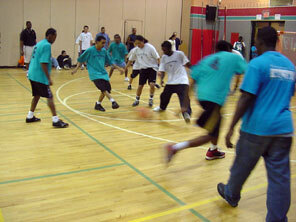 Team Ethiopia plays against Team Guasivirs in Blair's Indoor Soccer League. Blair’s indoor soccer league is bigger and better this year thanks to the work of many volunteers and a Montgomery County community grant. The aim of this program is to engage students and to provide a fun place for them to go after the last school bell rings. It is a community activity that gives equal opportunity to everybody who is interested in soccer. This program is different from normal sports activities because there is no strict eligibility rule. The program doesn’t require students to meet 2.00 marking period average to qualify. But any student who has below a 2.00 marking period average must attend an after school academic support session. The soccer league started approximately 10 years ago through the work of Mr. John Alcoba, a former ESOL teacher assistant. After Mr. Alcoba left Blair, Mr. Wang, an ESOL teacher handled the soccer league. Unfortunately the league kind of slipped away two years ago. According to Mr, Gainous, the principal of Blair, Mr. Moreno, the ESOL counselor, talked to him about the need to begin the program again. “Mr. Moreno brought it to my attention that we were having more students getting into more trouble. It seemed to occur after we have lost the after school program. So we needed to start the program again,” Mr. Gainous said. The league has a number of advantages. First, it provides students a fun and a safe place to go to. Another issue is it discourages gang activities. Students loitering in the street after the last school bell rings are likely to get involved in problems. According to Mr. Segura, the director of the league, the peak dangerous time is usually after school. “The time at risk is 3 to 5 pm. Between those times there usually are problems,” he said. The league this year is bigger than ever. The number of the teams is 24 teams and there are 8 students per team. Beside the increase in the number of the students there are also more volunteers helping. Officer Diaz, one of the Montgomery County police officers who is involved in the League stated that he has seen some good things from this activity. “They [the students] gain respect for each other,” Officer Diaz said. “It shows that students are learning. They can handle the problems without fighting,” he added. He believes this program is worth it. Students have fun as well as develop interaction with students from other countries. The Blair Indoor Soccer League is thankful to the various sponsors in providing efforts, funding and encouragement. Montgomery County Police provide funding and provide officers to give advice and security for students. Officers spend their time at least twice a week to view the games. “We make sure that everybody follows the rules. Safety is in everybody’s mind,” Officer Diaz said.